Scripps Institution of Oceanography at University of California, San Diego, is one of the oldest, largest and most important centers for global science research and education in the world. On June the 11th, Surrey Satellite Technology Ltd (SSTL) celebrated 25 years of space innovation. The British company was incorporated on June 11th, 1985, to commercialize small satellite research from the University of Surrey and has since become the most successful cash exit from a UK university spin-out when it was acquired by EADS Astrium last year. The view from the top down. A quick peek at the upcoming IBC 2010 trade show and exhibition in Amsterdam. Mr. Brender joined GeoEye in January of 2006 after eight years at Space Imaging as their vice president of Communications and Washington operations. He has more than 25 years of experience in public affairs, broadcast journalism and government relations and is responsible for all communications and marketing. In 2007, GeoEye established its GeoEye Foundation, and Mr. Brender serves as its first Executive Director. In 1998, prior to joining Space Imaging, Mr. Brender was a broadcast journalist for ABC News, spending 16 years at the network as an assignment editor and editorial producer. Before ABC, he served in the U.S. Navy as a public affairs officer and is a retired Naval Reserve commander. Mr. Brender began writing and speaking about high resolution commercial Earth observation as early as 1985 when he established the Radio and Television News Directors Association (RTNDA) Remote Sensing Task Force. The Task Force helped clear the way for high-resolution imagery to move from the defense and intelligence sector to the commercial sector. An Oxford scholar, Paul joined the UKs Defence Research Agency in 1991 (known as QinetiQ since privatization in 2001), to work on space-based surveillance remote sensing systems, going on to lead the innovative TopSat mission and supporting the launch and operations of four communication satellites. Joining SSTL in 2006, Paul has managed a team of project managers at SSTL working on a diverse range of missions and studies. In his new role Paul will lead his team in developing business opportunities for SSTLs small satellites, including entry-level geostationary and affordable interplanetary missions. Richard Hadsall is the founder and CTO of MTN Satellite Communications (MTN) in Miramar, Florida, and is also the CEO and CTO of the MTN Government Services (MTNGS) subsidiary in Leesburg, Virginia. From 1969 to 1972, Richard worked at Eclipse Systems, Fairfield N.J., specializing in fluidic computer and control systems. From 1972 to 1974, he was a sales engineer for Wilshire Electronics, in Passaic, New Jersey, specializing in electronic components for the military and aerospace industry. He became the vice president and general manager of Wire Concepts in Fairfield, New Jersey, from 1974 to 1976, and he then founded Crescomm Inc., which was sold to Pirelli in June of 1987, and went on to found RJ Earth Satellite Communications, providing communications equipment and services to local and regional governments. In 1981, Richard founded MTN Satellite Communications, and operated as the senior vice president and CTO and became the companys CEO and CTO in 2009. As a researcher involved in high resolution satellite remote sensing of both man-made and natural disasters I was very surprised to find myself trapped in southern India in mid-April due to the recent unexpected volcanic eruptions in Iceland by the closure of UK airspace, and indeed most of Northern Europe for the best part of a week. Having just visited the most southerly tip of India, an area badly affected by the tsunami in 2004, and seen the monument to those who died at Cape Comorin (Lands End), and researching Internally Displaced People, I found myself an unwitting Externally Displaced Person myself. Most of the Network Management Systems (NMS) solutions on the market today evolved out of Monitor and Control (M&C) solutions. Operators at an Earth station relied on the M&C system to monitor and control one or more antennas RF equipment without having to walk amongst the racks in order to determine if their was a failure on any piece of equipment. As network operators acquired or built out more infrastructure to meet the ever growing demand for bandwidth from their customers, M&C systems were forced to evolve into the NMS solutions on the market today. To remain innovative, efficient and cost-effective, more satellite operators are investing in the migration of their fleet operations from a legacy ground system to a state-of-the-art commercial off-the-shelf or COTS-based system. A challenging but worthwhile process, the transition must be carried out with minimal risk and without any impact on the satellites operations. However, a successful migration enables the new ground system to have a better performance with expanded capabilities, such as automation and lower costs, over the fleets lifetime, which is often at, or above, 15 years. Suppose you want to start a business to provide online access for offshore oil rig platforms off the coast of Nigeria. Initially you want to provide interactive tutorials on how to safely extract the most oil and gas from the undersea well without endangering the environment along with training on worker safety. Insight... Alternatives To Dedicated Space Platforms, author: Scott Smith, Executive Vice President, Iridium Communications Inc.
Economic realities dictate that the satellite industry will probably be facing a short-term future characterized by budget cuts and delays in government-funded space programs. There is growing concern among many in the Earth sciences community that this may result in significant gaps in the collection of critical climate observation data in the next few years. Likewise, the government and military sector face the increased likelihood of service gaps in several important mission areas. 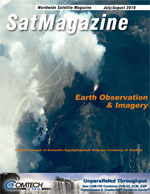 This article summarizes the work performed by the Volcanic Activity: Processing of Observation and Remote Sensing Data (VAPOR) team during the International Space University Space Studies Program in Barcelona, Spain. The objective of the VAPOR project is to improve early warning and hazard tracking capabilities as they pertain to volcanic activity. The main deliverable of this project is a framework for the design of a system capable of integrating data from global providers, standardizing that data, processing it into useful information, and disseminating both data and information to the necessary end-users. In keeping with its mission to advance space-related endeavors to inspire, enable, and propel humanity, the Space Foundation believes that future success in space depends on an educated and well-trained workforce, and now is the time to build that workforce through Science, Technology, Engineering, and Mathematics (STEM) education. The RADARSAT Constellation is the evolution of the RADARSAT Program with the objective of ensuring C-band data continuity, enhanced operational use of Synthetic Aperture Radar (SAR) data and improved system reliability over the next decade. On December 5th, 2000, ImageSat international became the first, non-US-based company to successfully deploy a commercial, high-resolution, imaging satellite. This was EROS A, weighing in at 250 kg, which was propelled into its orbital slot by a Russian Start-1 launch vehicle.